The role of preaching in the church is changing. It is no longer about simply transferring Bible information; it is about developing mature disciples that can courageously engage a post-Christian culture. Yet there is much that distracts us from effectively hearing God’s word. The question is how do we develop teaching plans that promote healthy discipleship? Also, how do we incorporate creativity in the sermon-planning process? 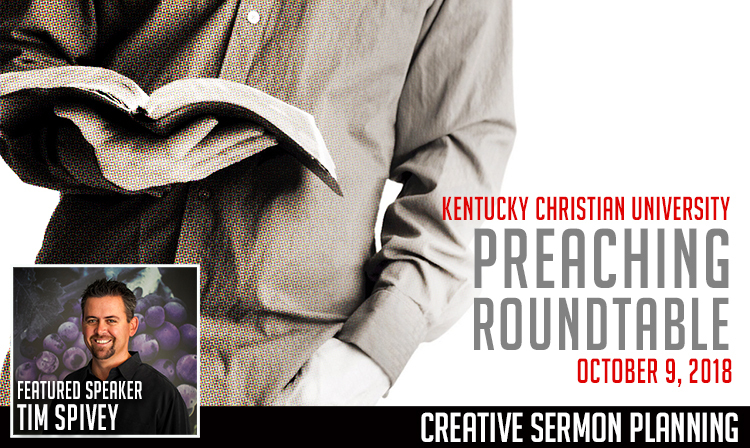 You are invited to a unique, one-day Preaching Roundtable. In this one-of-a-kind experience, our speakers will not deliver canned lectures but facilitate encouraging conversations about how to engage creative sermon planning in ways that will promote healthy discipleship practices. Highlights Include: Interacting with our keynote speakers; attending chapel and practical, relevant workshops; sharing lunch with the speakers; potential giveaways; and enjoying an encouraging time with fellow ministers. Tim Spivey is a Southern California native with a deep and contagious passion for God and ministry. Through gifts of leadership and teaching, Tim offers biblically-based preaching and directional leadership to New Vintage Church. Tim is the author of a well-known blog on leadership and theology (www.timspivey.com), as well as a number of articles and the book Jesus: The Powerful Servant. He holds degrees from Pepperdine University and Abilene Christian University. For more information, contact our host Dr. Rob O’Lynn at rolynn@kcu.edu or 606-474-3230. Are you interested in receiving information about our graduate programs? Maximum of 10. If more than 10, please contact Rob O'Lynn at rolynn@kcu.edu. Please provide the names of additional participants below. One name per line.